Cloud Gate Dance Theatre of Taiwan in Nine Songs. 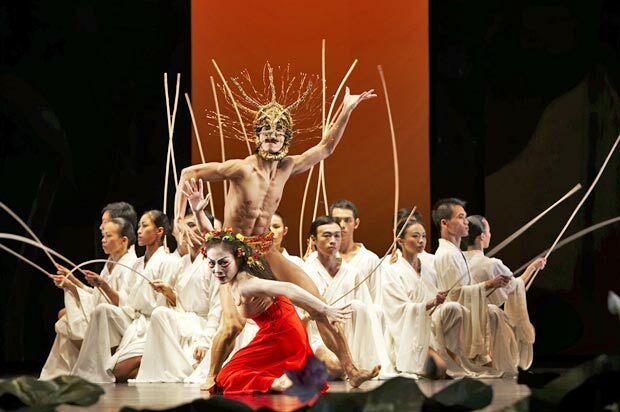 Cloud Gate Dance Theatre of Taiwan is a regular visitor to Hong Kong and in August it returned to the city with a newly-revived production of “Nine Songs” by its world-renowned choreographer, Lin Hwai-min. The original sets, costumes, and choreographic records of this 1993 work were unfortunately destroyed, along with many other works, in a fire at the troupe’s studio in 2008. Miraculously the masks of “Nine Songs”, which were inside a crate, survived as if due to divine intervention, and this gave Lin the impetus to revive the work. “Nine Songs” is divided into two acts and is based on the poems of Qu Yuan written over 2000 years ago. There is still a holiday every year in the Chinese calendar, known as the Tuen Ng festival, to commemorate this great poet. 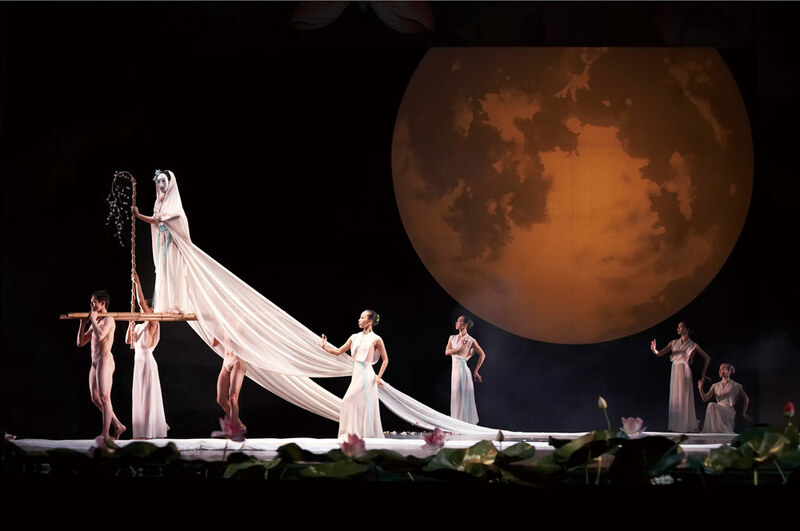 The attractive stage design by Ming-Cho Lee is dominated by a lotus pond at the front of the stage, and the backdrop is also beautifully painted with lotus flowers – the Chinese symbol of reincarnation. Shamans in masks appear at the beginning of the shorter first half paying homage to the gods by enacting various religious rites. The mood is bright in the beginning but gradually becomes more sombre and bleak until there is a total descent into darkness by the end. The theme of Act 2 is about the four seasons. A recurring character is a man dressed in black carrying a suitcase around, which seems to signify the passage of time. Spring is the most lively section. The goddess of the Xiang River, attired in a long white veil, is lifted on a bamboo platform when she first appears. She however waits in vain for her lover. Summer is unexpectedly gloomy with the god of clouds being carried in the air by two human attendants and moving ponderously. As in the previous act, the atmosphere gradually becomes more pessimistic and sombre. Lin really has a flair for depicting human suffering and desolation. Autumn sees a mountain spirit dancing in solitude. However his sadness and soundless cries seem to warn of an impending catastrophe, the theme of the next section, Winter, which depicts death and destruction and is full of grief and mourning. It is too long and intense for my liking. Towards the end, there is a memorable passage when the names of notable people who have recently sacrificed their lives heroically are recited. And this is followed by a long candlelight vigil before the curtain falls. Lin’s choreography is full of theatricality and powerful imagery. The whole troupe’s dedication and excellence in performance was most commendable, if only there were brighter sections to provide a better contrast to the pervasively dark and mournful tone of this piece.